All of our massages are custom massages. The techniques used by your therapist will be drawn from a knowledge of various modalities to maximize the results that the client is looking for. Our services are not complete without a free assessment*. Your therapist is trained in kinesiology, anatomy, pathologies and assessment and strategizing and will customize a massage to help alleviate specific pain or disfunction. Bring massage therapy to your company event or private party. .Provide your guests with an invigorating "pick me up" massage while sitting in one of our comfortable massage chairs. Or have them lie down on one of our massage tables and receive a relaxing, stress-relieving massage. While receiving a swedish massage, the client is lying on a massage table, unclothed, with sheets covering their pubic and breast areas at all times (aka: draping). Oil or lotion is used to reduce friction on the client's skin and help facilitate the near continous contact between the massage therapist's hands and the body of the client during the massage. Most practioners of Swedish Massage create a relaxing environment for their client by using a private, quiet space that allows the client to relax and receive the massage well. The strokes used during a full-body swedish massage are vary depending on the body part and intention of the stroke. Effleurage is a long stroke that uses consistent pressure throughout the stroke, with the massage therapist's hands never leaving the client's body. It helps stimulate the lymphatic system and venous blood flow in the body. Petrissage is a deeper stroke that where the therapist lifts and compresses the client's muscle mass. Pettrisage is a great way to warm the muscle for deeper work while softening superficial fascia, increasing blood localized flow and decreasing adhesions in the muscle. Friction, small deep movements made very locally, is helpful for even deeper work and works well as an assessment tool. Where deeper massage is not possible, such as the front of the tibia (aka shin bone), vibration, or fine, quick movements (think, trembling) can stimulate or sedate an area, depending on how it is applied. Finally , there is tapotement; gentle yet firm rhythmic tapping of the therapist's hand on the client's muscle mass. It is an effective technique for softening tissue for other work and stimulate the nervous and circulatory systems. Our muscles receive most of the direct attention during massage. The techniques mentioned above can contribute to muscle health by reducing adhesions, stretching the muscle, helping to remove metabolic waste from the muscle fiber, stretching the fascia and relieving tension in the muscle. The result is a muscle alleviated from pain with a maximized range of motion, thereby increasing range of motion in the joint(s) that the muscle cross. This said, the effect of touch on the body goes beyond the physical work performed. Touch is emotionally powerful. When applied by a caring and skilled therapist, swedish massage can leave you feeling less isolated from others and generally less stressed. Shiatsu is a Japanese form of massage therapy derived from Chinese Traditional Medicine. Zen Shiatsu was formally developed by Shizuto Masunaga, a Japanese psychologist, in 1977. Shiatsu is based upon the idea of Ki, the energy flow throughout the body. Ki tends to flow through the body along energy pathways called meridians, each of which is associated with a vital organ. Imbalaces in the flow of Ki in the body are thought to result in illness . Shiatsu utilizes pressure points that correspond to different organs and energy pathways throughout the body. The Shiatsu practioner intends to eliminate energy imbalances within the body, allowing the bodies systems to work in harmony with one another. Applying palm or finger pressure, vibration, rocking, stretching to specific points on the body, the Shiatsu therapist stimulates and the nervous, circulatory and musculatory systems. and manipulates energy flows to different organs through specific meridian (pathways). Pressure is applied using the thumbs, fingertips, feet, knuckles, palms, elbows, and knees. 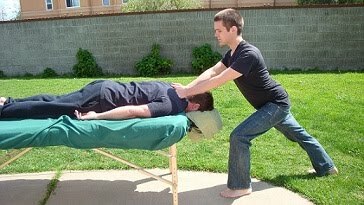 Shiatsu massage is performed on mat on the floor, with the client fully clothed. No oils or lotions are used. Massage tables and massage chairs can also be used. The client should wear comfortable clothing. Shiatsu is used to promote a general state of well-being by reducing anxiety, depression and stress. It can decrease pain throughout the body and is a great way to just relax. It feels good! Often, after one session a client can have relief from common pains such as menstrual cramps, back and shoulder pain, headache and arthritis. However, best results typically occur over repeated sessions for chronic conditions. Shiatsu is also for athletes and martial artists to assist in recovery from injuries.